NOTE: The Forest of Fears attraction does not allow photos or video of any kind while going through it, so all photos in this review are from the outside. 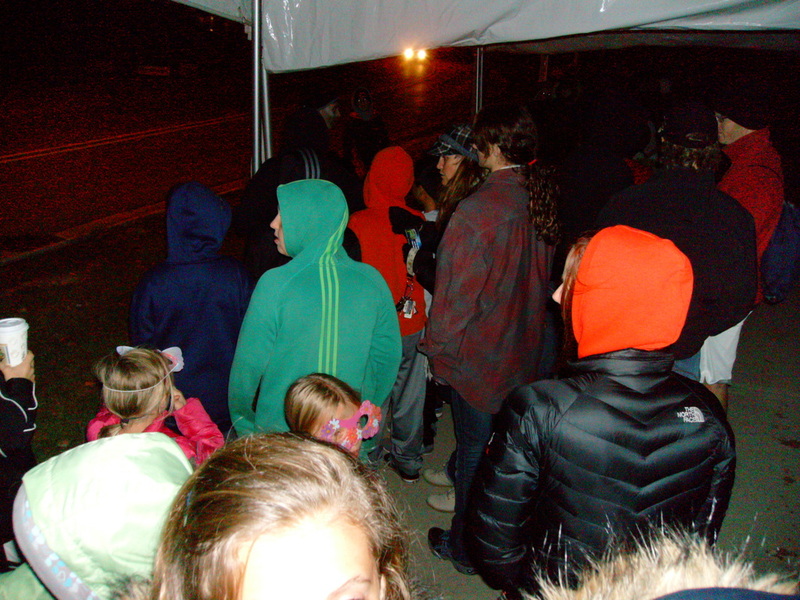 The Haunted Woods is combination outdoor/indoor haunt located in Orland Park. The attraction began in 1998, and is operated as a fundraiser for the Orland Park Lions Club. It consists of a long, winding trail made up of various scenes, as well as an indoor portion located in the middle of the trail. The Tourers first visited this attraction in the early 2000's and returned for another visit in 2010.. The 2010 visit, despite the cold, was decently enjoyable. 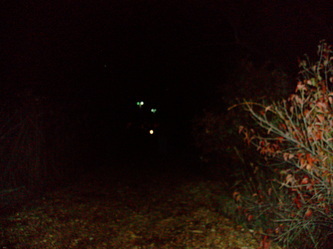 The trail seemed quite long and the the indoor portion of the haunt, which resembled an abandoned cabin in the woods was well-designed. The haunt lasted between 20-25 minutes, and although we wouldn't say that it was outstanding, it was decent enough, and the price of $8 (with a canned good donation) was low enough to warrant a potential future visit. We at the Tourers always like to patronize pay haunts that operate for a good cause, and since it's one of the relatively few outside haunts, we decided to give Forest of Fears another shot in 2012. The night we went was rather warm (for October), and we made sure to get to the haunt before they opened in order to avoid any long lines. When we arrived, our strategy seemed to have worked well. The haunt opened at 7 and we arrived approximately 10 minutes beforehand and were greeted with a decently short line (perhaps 50 people). Since the Forest of Fears let people in in groups, we figured that our wait wouldn't be more than 15-20 minutes. Since it wasn't too cold, we decided to wait it out. We bought our tickets and a couple of pieces of pizza from the concession stand (the haunt sells a good variety of food and snacks for waiting patrons). The pizza we got was hot, cheap, and very delicious. Unfortunately, it also turned out to be the best part of the entire experience. The problems started even before we got into the haunt itself, as the short 15-20 minute line we were expecting turned into almost an hour wait before we even approached the entrance. Although we weren't certain why there was such a delay, word through the crowd was that the actors weren't ready. While a short delay might be understandable, given that we arrived before the haunt opened, over an hour was a bit unacceptable, particularly since the weekend we went was not the first weekend of the season. We finally arrived at the entrance about 8:15, by which time were were cold and a bit disenchanted. 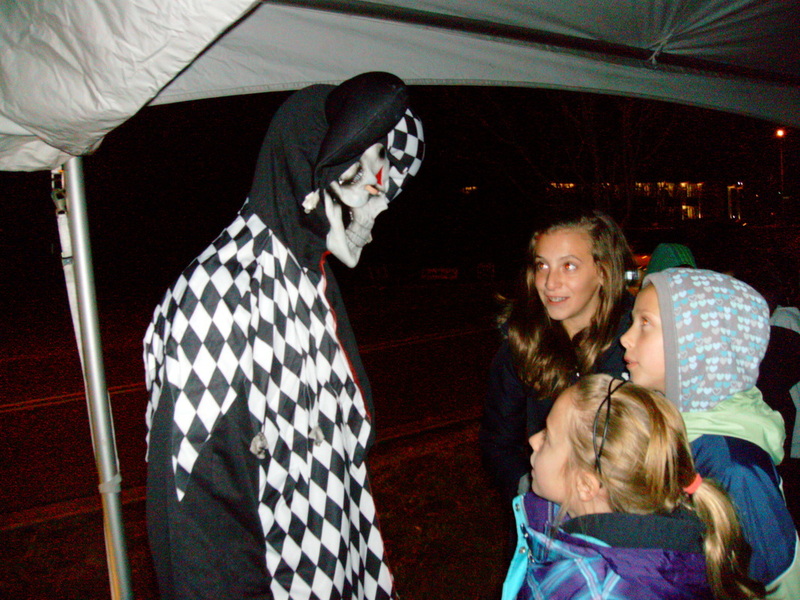 However, given our experience in 2011, and given the fact that we had already purchased non-refundable tickets, we still wanted to see what the haunt had to offer. 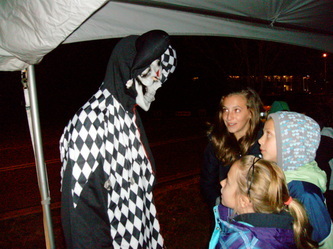 Each group to enter was given a set of guides to lead them through the haunt. The two guides we had seemed disinterested from the beginning, halfheartedly leading us through the trail and making little attempt to keep the group together or to keep members of the group from wandering into other sections. In addition, while they were behind us they were continually talking to each other, rather loudly, about things unrelated to the haunt, which certainly didn't add to the atmosphere. Also, there were times when our guides wandered in front of us to talk with actors in upcoming scenes, which not only spoiled the surprise for the visitors, but also took us completely out of the "Haunted trail" vibe that were were hoping for. Unfortunately, the guides were not the only problem. A number of the actors also seemed to be completely disinterested in what they were doing. For example, in one area of the haunt we rounded a corner to find several actors with their masks off, simply hanging around talking to each other. They looked at us and didn't even react or make any attempt to get into character,which led us to think that we might have accidentally wound up in the wrong place (as our guides did little to "guide" us we did wind up getting slightly ahead of the rest of our group, so we thought we might have made a wrong turn). However, it turns out were were in the correct location, as one of the actors asked us if we were the next group, then put on his mask and gestured to all of the others to put their masks on as well. They actually got into hiding while we were standing there watching them. A truly shoddy performance, and a breaking of one of the cardinal rules of haunts: don't break character. After some more aimless wandering with very few scares or even actors to speak of, we found ourselves just wanting to call it quits and move on to our next haunt visits, but we still had the indoor portion to go through. This year it was decorated like an old, worn out hotel, complete with annoying doorman character outside. While some live actors add atmosphere to scenes, and while we don't mind a bit of sarcasm in our actors, this particular actor seemed to confuse sarcasm and wit with being rude and, rather than coming across as funny, some of his remarks seemed more as if he was insulting visitors. When we finally entered the haunt, we found our selves in a recreation of a rundown hotel lobby from the 1940's. We actually were impressed with the design of this room, as it featured old furniture, well dressed actors, and even a vintage non-functional radio from the 1940's. If only the outside portion had paid this much attention to detail we might have rated this haunt more highly. At the side of the lobby scene were some mock elevators that led further into the haunt. These, too, featured a live actor, this time a bellboy. In contrast to the rude doorman, this actor was actually decently amusing, and he kept us entertained while the "elevator" took us to the rest of the haunt. Unfortunately, the positive vibe we got from the lobby scene quickly fell apart as we made our way through the rest of the indoor portion. In the next room, we encountered a live actor who informed us that we were going the wrong way and pointed us in a different direction. While most of the group went in the new direction, Paul (one of the Horror Tourers) stayed behind, telling the actor that he was lying and that the correct way to go was the way that the actor told us not to go. While most of us got stuck in a dead end, Paul insisted on going the way the actor told us not to. Well, it turns out Paul was correct all along. The actor was intentionally misleading us. While this is a common tactic in haunted houses, usually the actor misdirects once and then points to the proper direction. However, in this case, the actor kept insisting that the wrong way was the right way, leading our group into a tightly packed dead end and leaving us in there an inordinate amount of time. This is A) not fun, and B) not really enjoyable for patrons, especially smaller children (of which we had a few in our group). Finally we wound up in the right direction, but despite the fact that we were moving things didn't get much better. We found ourselves in another dead end with another actor refusing to tell us the right direction. Once was bad enough, so we ere in no mood to go through it all again. The actor kept telling us to feel the walls but took too long to tell us the proper way to go. The kids with us (and their parents) were understandably getting nervous, and it certainly spoiled what little good atmosphere there had been so far. The last portion of the haunt consisted of a series of maze segments, a portion of which ran through what looked like an abandoned laundry room. In this portion we found a live actress sitting on a toilet (a prop) taking pictures of herself and texting. We were not sure if she knew anyone was in the room, which might have been somewhat excusable, but when we approached her, she simply took our picture and explained that she was talking to her friend. There was no attempt whatsoever to get into character, which only added insult to injury and left us feeling even more disappointed about the whole experience. Overall, we were happy to get to the end of the haunt and move on to the next one. We were quite surprised at the quality of the haunt, given that it has been running for a good number of years, has a good reputation, and was also decent in 2011. Sometimes, when we go into a haunt cold and do not know what to expect and wind up being disappointed that is understandable, as that's the chance you sometimes take. However, when you go into a haunt having been there before, and you kind of know what to expect, it is especially disappointing when it turns out to be completely less than what you anticipated. 2012's Forest of Fears did badly according to several of our rating criteria, including actor enthusiasm, use of space, and amount of decorations, with actor enthusiasm scoring exceptionally low. We don't give negative rating numbers, but in this case we could certainly make an exception. Add to that the unexpected long wait to get in and the general disorganization and it all makes for a poor experience. While we understand that the haunt is staffed by volunteers and we do take that into account, the fact that this is not the haunt's first year and that it was not opening weekend (when kinks are often worked out), there really wasn't much excuse for the poor overall quality. 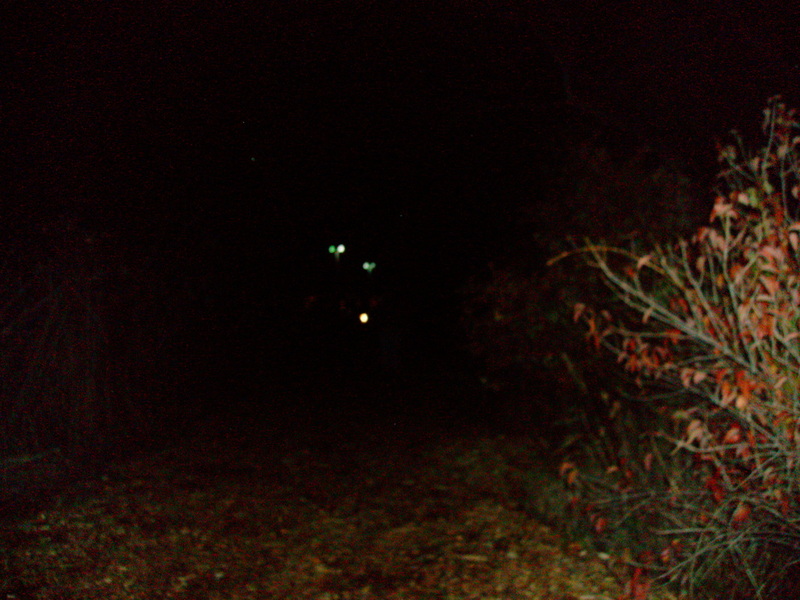 Our experience definitely made us much less inclined to visit this haunt again. 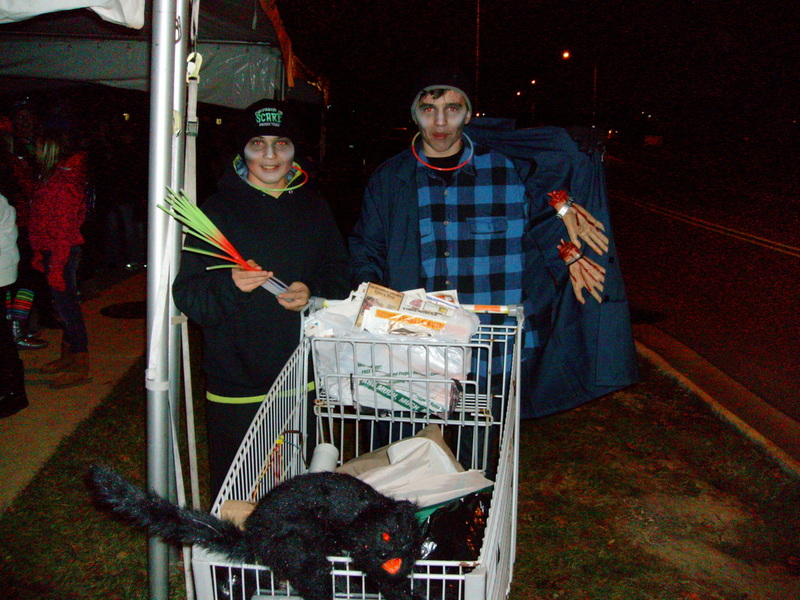 Of course, your experience may vary, and every haunt is entitled to an off year now and then. A couple of things that were positive were the food (seriously, it was very good and low-priced, and did help us endure the long wait), the lobby scene in the indoor portion, and the bellboy live actor. Overall, though, the negatives far outweighed the positives and, much like Frankfort Jaycees, the lack of actor enthusiasm really put a dent in our overall experience. While we never want to dissuade anyone from enjoying any haunted attractions, and while the Forest of Fear does support a good cause, we simply can't recommend it. You might be better off giving a donation directly to the Orland Park Lion's Club instead.